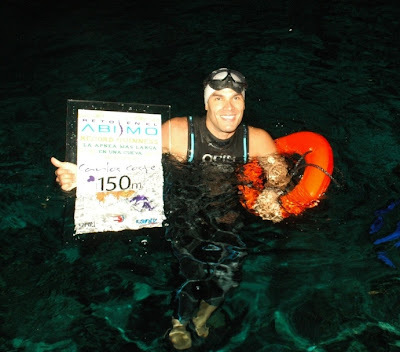 Carlos Coste, a Venezuelan freediver, achieved his new record apnea in a Mexican underwater cave, the Cenote Dos Ojos, with a linear swim of 150 meters (dynamic). It took him 2 minutes and 32 seconds. Dos Ojos is a flooded cave system located south of Playa Del Carmen and north of Tulum, on the Caribbean coast, in the state of Quintana Roo, Mexico. It is with 119 meter the deepest cave in the area. The exploration of Dos Ojos began in 1986 but is still ongoing. Currently 67 km have been surveyed. You can follow the current progression on the Ejido Jacinto Pat Project website and on the website of the Quintana Roo Speleological Survey. The record has been approved by Guinness World Records. Can Bats And Wind Turbines Mingle?